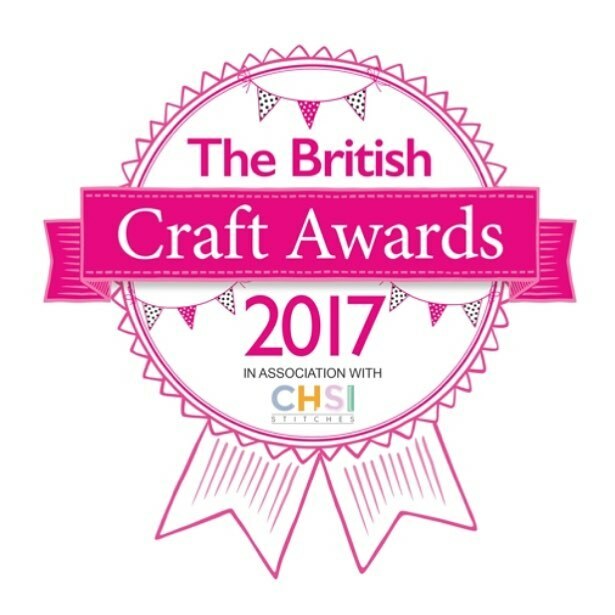 British Craft Awards 2017: Vote for me? I saw this British Craft Awards 2017 badge on my Instagram feed and by going to vote I found myself nominated in the Quilting blog of the year category! A surprise and a thrill to see myself there alongside some other very familiar names...hi Jo, Lynne and Ali! Even after a bit of research, I'm not totally sure what the British Crafting Awards are. They cover many categories, (sewing, quilting, paper craft etc.) and Immediate Media, who produce many craft magazines, are behind them, that's all I gleaned from Googling. 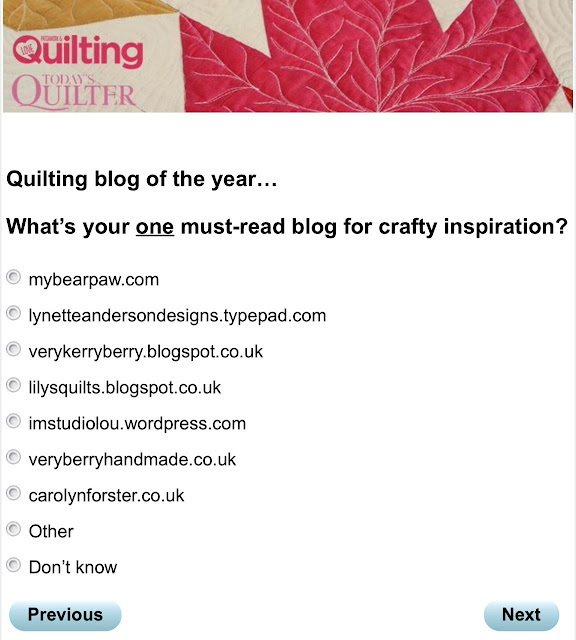 I don't think there is an actual prize, rather the recognition that you are a part of the craft industry. You can vote for the category of your choice (or all the categories) here. It's relatively straightforward and there's a prize draw of Amazon vouchers for those who vote. Realistically, it may be a bit of a long shot for me but, who knows! I'll wait and see and it's lovely to be in the running. Time for my monthly visit to Eternal Maker and my colour palette is definitely Autumnal! I've included a mix of brushed cotton, lightweight chambray, linen cotton blend, rayon/cotton double gauze and quilting cotton alongside some pattern suggestions. Kokka, pressed brushed cotton,Rings in mustard. The description of this fabric is very interesting; the circle ring image is pressed into the fabric. Suitable for skirts, jackets and trousers. Robert Kaufman cotton chambray-dot in indigo Floaty chambray, great for dressmaking although you may need to line some skirts. Girl and the squirrel Iris tee kit. This includes the Two Stitches Iris Tee pattern (age range 6 months- 9 years) and fabric to make a Tee up to age 5 years. Kokka Botanica black/monochrome linen blend by Ellen Luckett-Baker. Sevenberry Landscape in grey. Beautiful print on Japanese cotton. Nan Iro Rayon double gauze, triangle blue (Kokka). This is a new one for me, rayon (lyocell) cotton double gauze. I'm imagining this is extra drapey and what a gorgeous print. I'm also thinking, gathers, unpressed pleats tops and dresses- the Liesl Gallery tunic/top would be a easy choice for this and the Deer & Doe Aubepine would be perfect too. Kokka, yellow/monochrome linen blend fabric by Ellen Luckett Baker. 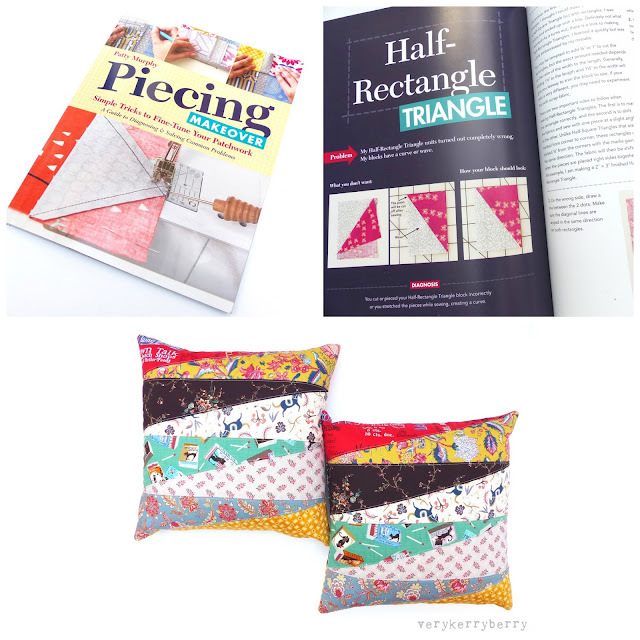 If like me you like finessing your piecing and learning new tricks to improve your piecing accuracy, this is the book for you. I'm not familiar with Patty but her blog is here is you want to read more about her. It's easy to read with a photo rich layout, so you can get up close with common piecing issues and be given common sense and easy solutions to those problems. 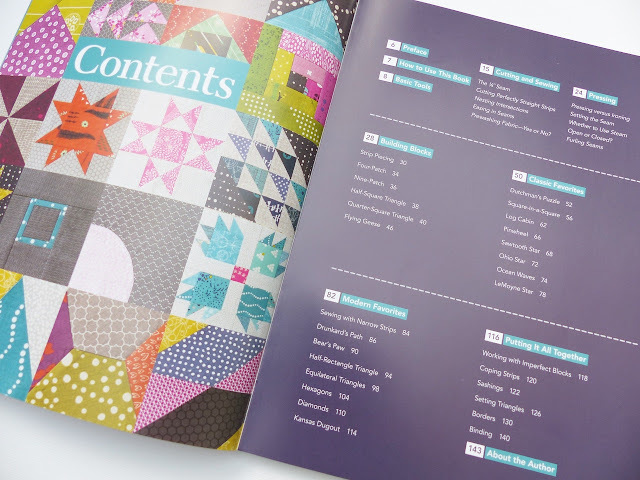 Either work you way through it for a bit of everything or head straight for the contents page and choose a particular block or feature that you'd like to discover techniques for and read some common problems and their solutions. 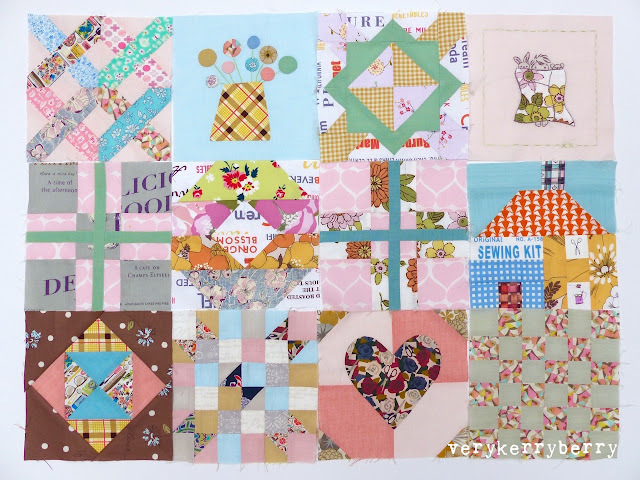 As a fan of piecing/quilting tips - as well as Pinterest boards I keep a photo folder of screen grabs of some of the best I see online - I did wonder if there would be sufficient new stuff for me but yes, there definitely is. Patty's advice is knowledgable but not judgemental or dogmatic, e.g. in the basics section at the start of the book, the age old pressing seams debate is addressed in bullet points. Some quilters like to be told- definitely press one way/open etc. but I feel the decision needs to be based on many factors- fabric colour, bulk, the sort of quilting that will be used etc. so I agree with Patty, firstly you need to know what the different options are and then "Overtime you will learn to anticipate the best way to press a block and think it through before you start". I wanted to test a new tip on a project so I plumped for half triangle piecing. I had some cushions in mind using some souvenir fabrics bought in Amsterdam on a summer holiday plus some stash fabrics and the only way I had thought for piecing large half-rectangle triangles was hand drawn paper piecing templates on very large paper- I was planning on making 18" square cushions so larger than A4/letter paper allows. Patty suggests a method and I carefully followed her with some test fabrics. Like many of you I'm sure, I often have a mental block when working with diagonals so I referred constantly to the photographs, made sure my diagonals ran the same way and it worked a treat. It is still a tricky shape; once the block is pieced it needs trimming down and I put washi tape on my ruler to help with this as you can't line the ruler with the 45 degree diagonal line like you would with a half-square triangle. As you can see, I came out of it with a pair of half-rectangle cushions. 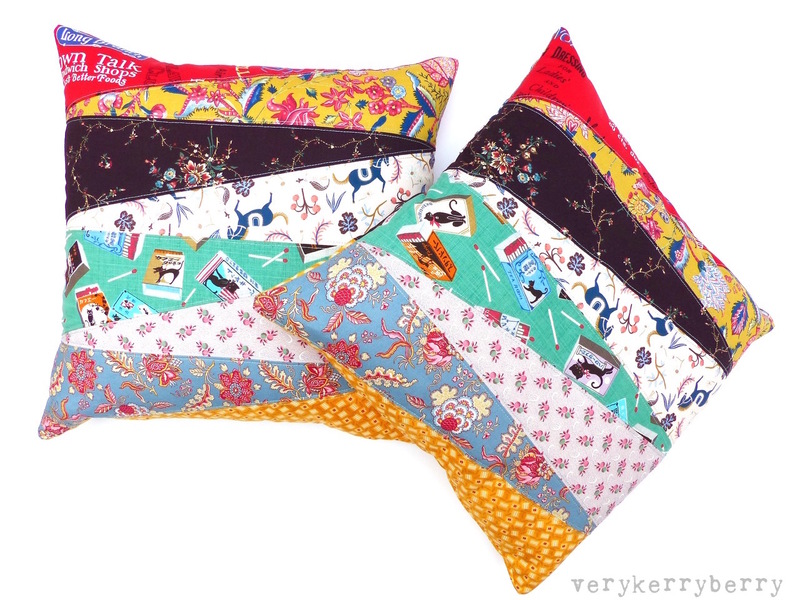 The nature of this block is that it will make a pair and I was replacing two pillows so it worked out perfectly for me. I'm working my way through this book. The pictures are large and there isn't too much text on the page so I find it a great book to read whilst sitting on my bed and I mark pages with post-it notes or commit tips to memory. It does lack an index which is a shame because at it's heart it is a reference book and although the contents page is relatively comprehensive, I can't quite understand why it doesn't have one - that's my only grumble. As you can see, the Problem-Diagnosis-Solution concept repeats all the way through the book. In amongst the various advice there are some great rescue remedies for that moment when you think you've really messedup. Sometimes those moments create the defining feature of a quilt although it doesn't tend to feel like that when you realise your border fabric is 4" too short or you've trimmed a block a little too much. Piecing Makeover is going on my shelf next to my other favourite quilt reference, Erin Burke Harris' Quiltessential which I use to check things like quilt maths or techniques that I don't use very often. This would also be a great book for a guild to club together, buy and use at meet-ups, maybe even share their own clever tips with each other. Available at the usual places. 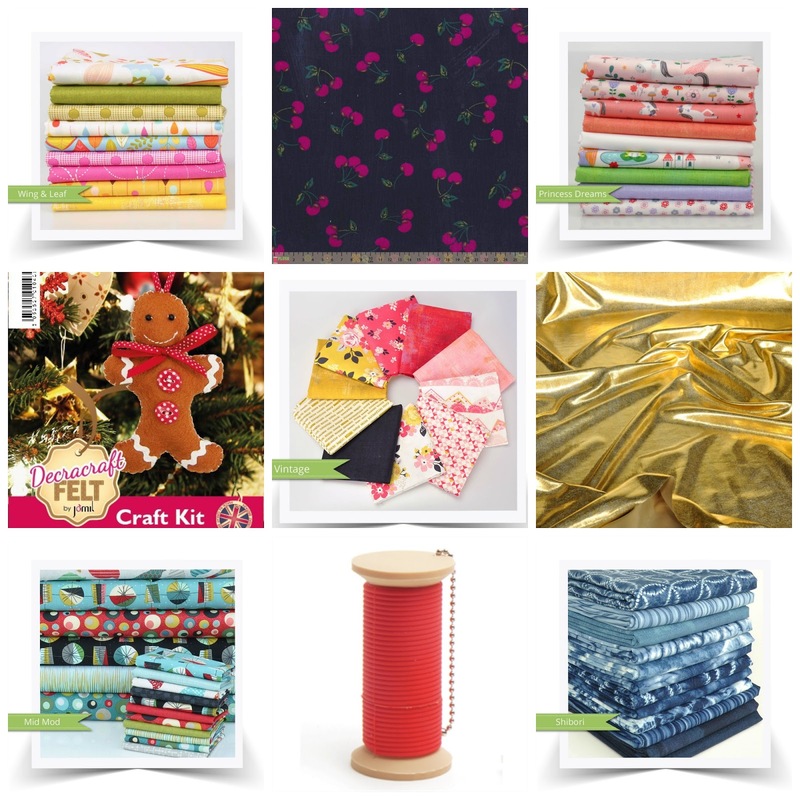 Fiona from Sewing Directory put a shout out on Instagram for people interested in reviewing a new sewing magazine so I quickly left my details and here it is, Sew Now. 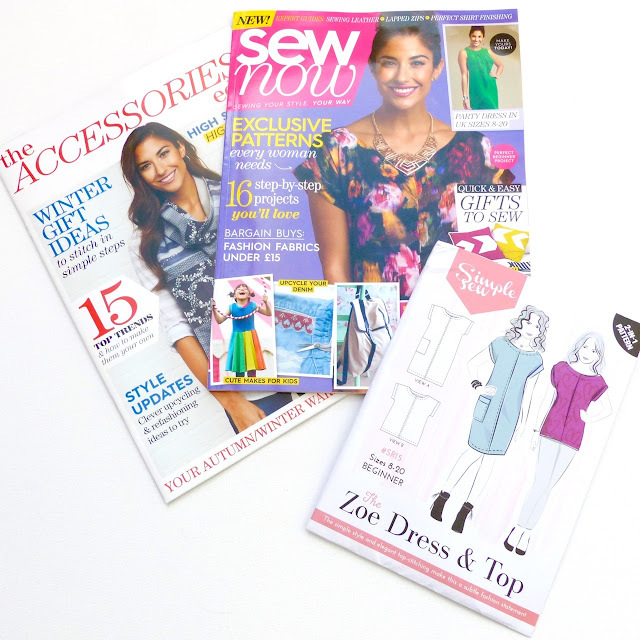 There's a huge range of sewing magazines available at the moment which can only be good for sewists- such a choice was unheard of a couple of years ago. 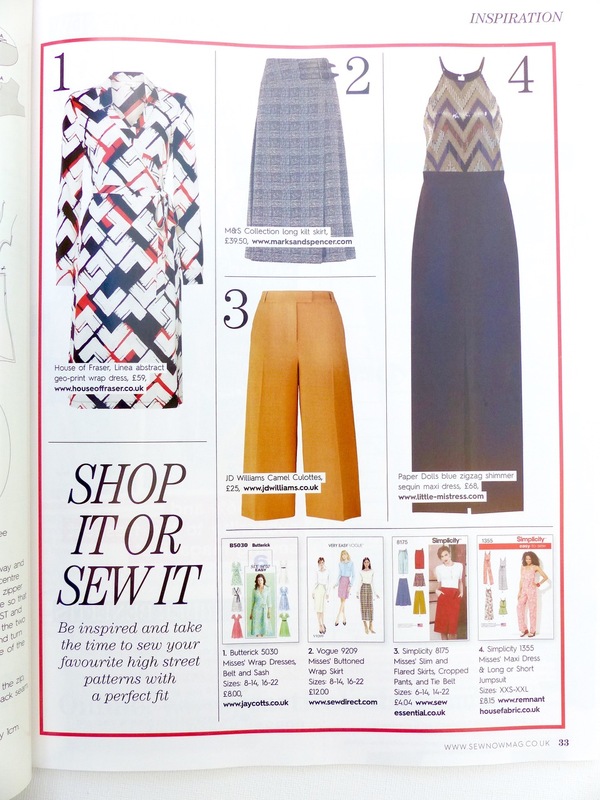 Sew Now has a reader-focused fashion theme which comes through strongly in the debut issue. For £5.99 you get the main magazine plus a Simple Sew dress/top pattern and an accessories magazine plus additional offers that are well worth having inside the magazine. The content is a mix of projects, fashion features with things you can buy as well as make. Projects range from beginner to intermediate and include accessories like the lovely canvas rucksack as well up-cycling and revamping. It's from Practical Publishing which also publishes Love Sewing and Quilt Now and I can see some of the content crosses over although Sew Now has a distinct look of its own compared to the other titles. 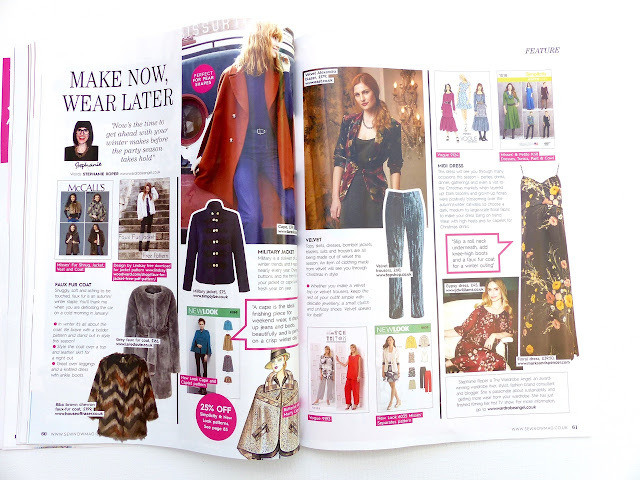 There is a definite crossover between high street fashion and homemade with features on making bow ready for Christmas party wear, supplementing you home made with high street accessories and clothing and finding patterns that pick up on popular fashion details. My favourite element was the range in models, from the usual young slender models to older models and different body silhouettes including plus size which is part of their 'Plus size promise' to feature readers with fuller figures. I would've liked to see Anne Acosta (below) in a standing pose so we could see more of the dress she had made. 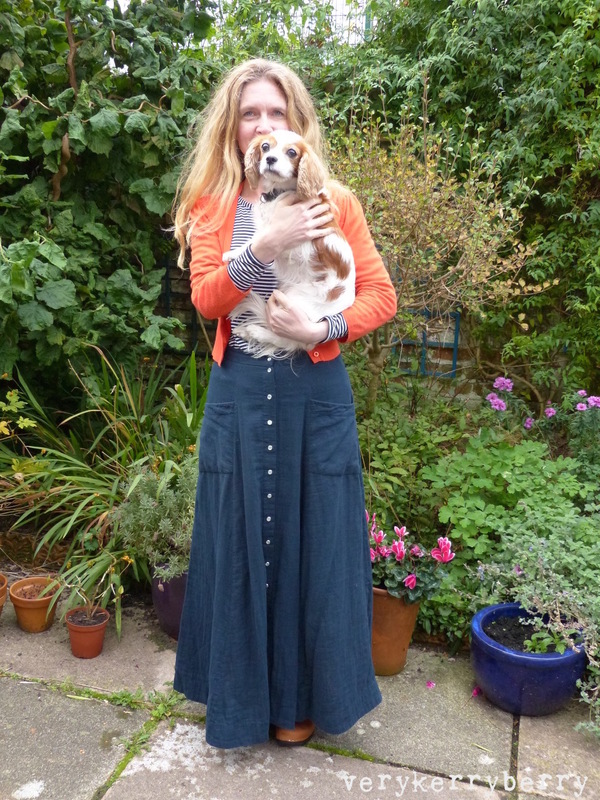 You may also know Anne as @new_vintage_sewing from Instagram! 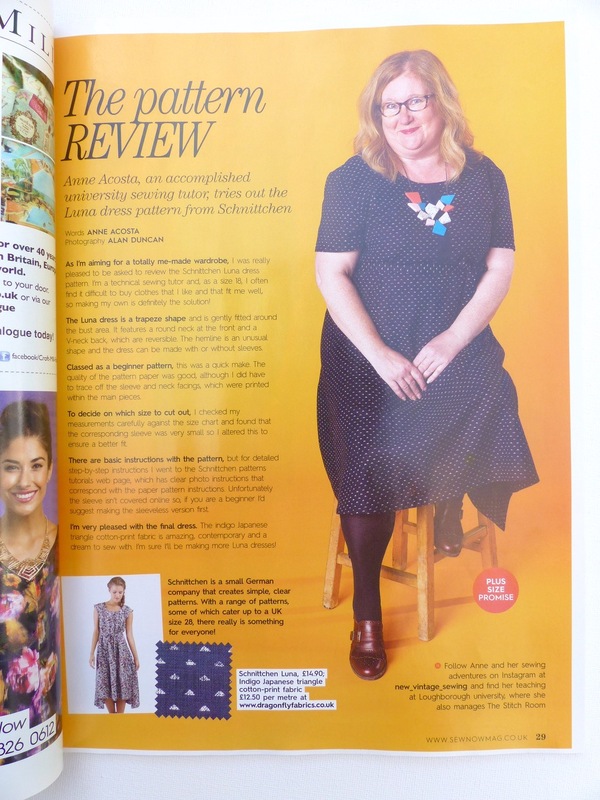 When I first heard about Sew Now and it's fashion focus, I quickly assumed it was going to be aimed at young and beginner sewists but that's definitely not the case. 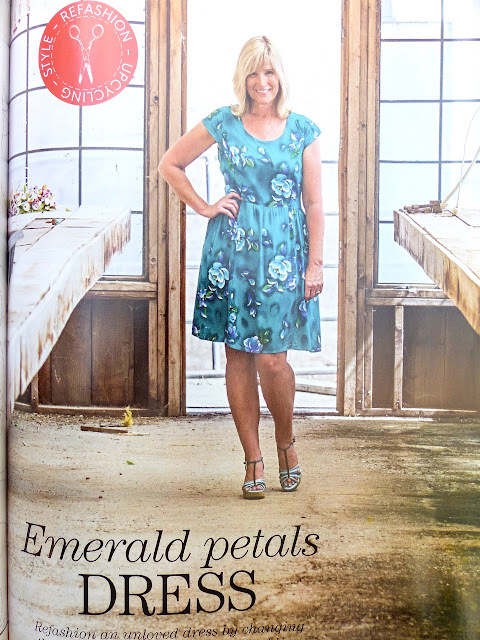 it has much broader appeal for anyone who likes fashion and high street trends and there's more technique and detail that I would usually expect in most of the established dressmaking magazines. This issue has a feature on making men's shirts from Sewing Bee contestant Jamie Kemp of maledevonsewing.blogspot.com as well as a -'how to' by Wendy Ward on lapped zips which is an excerpt from her new book, A Beginner's Guide to Making Skirts'. 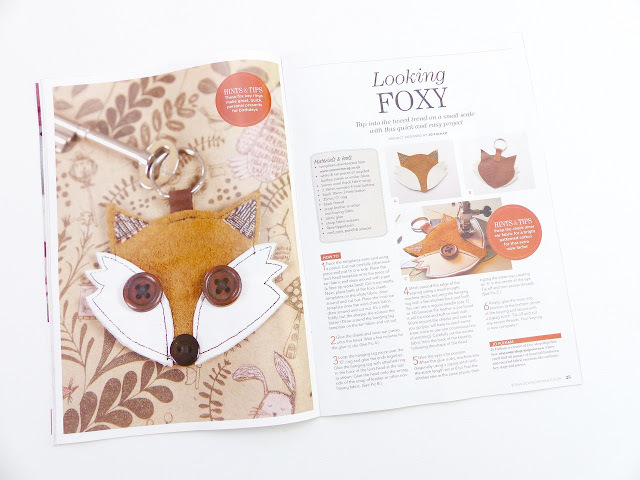 and a foxy keyring in suede and leather scraps- it would easily work in pleather (fake leather) and suede pieces too. If you like a subscription offer for Sew Now you can buy three issues for £6 (currently available for UK residents). 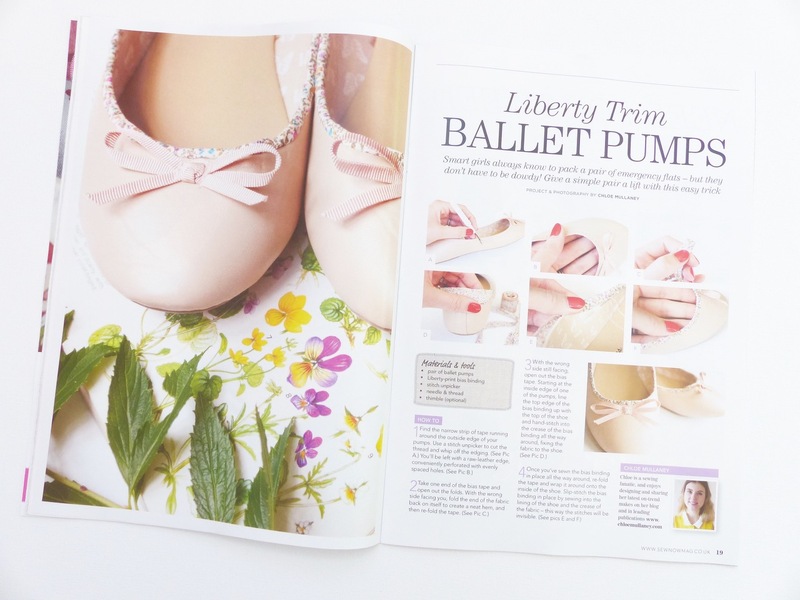 There are a lot of offers inside the magazine as well as the free patterns and accessories mag. 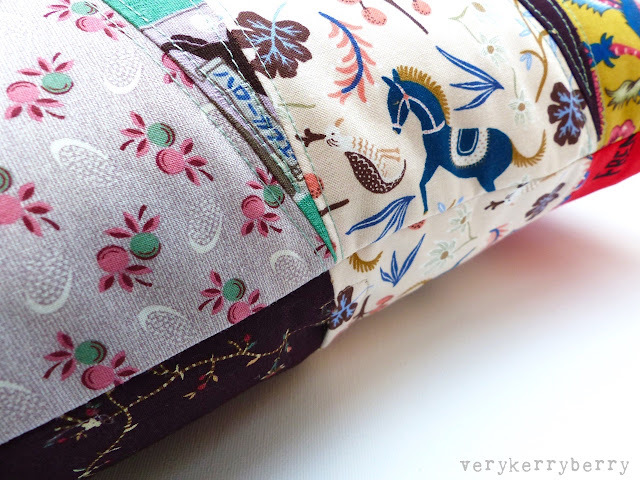 There's a chance to send off for a free printed pattern of the By Hand London Victoria blazer- still in stock when I last looked, and a very cute Sewing Bee tin at a reasonable price (I succumbed!). The website is still awaiting a few final tweaks but the Facebook page is up and ready. 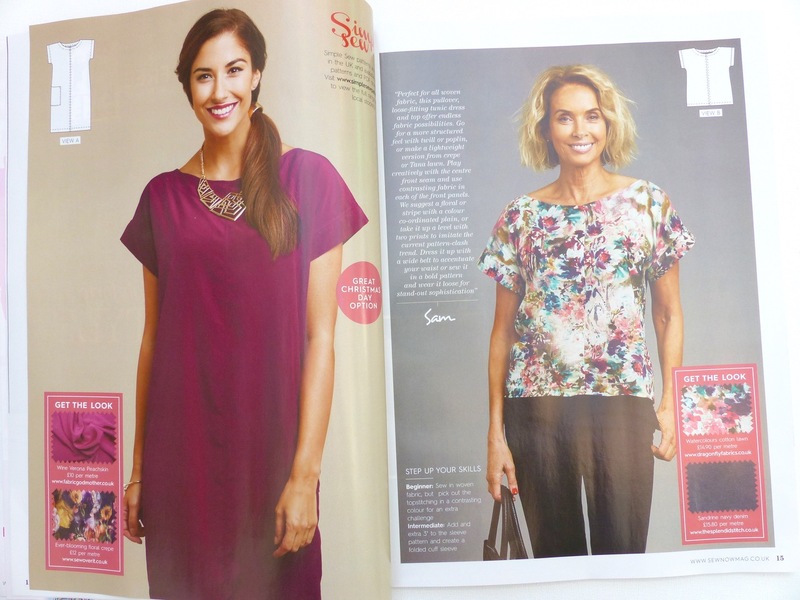 You can also read an interview with Sew Now editor Sam Sterken at the Sewing Directory website. 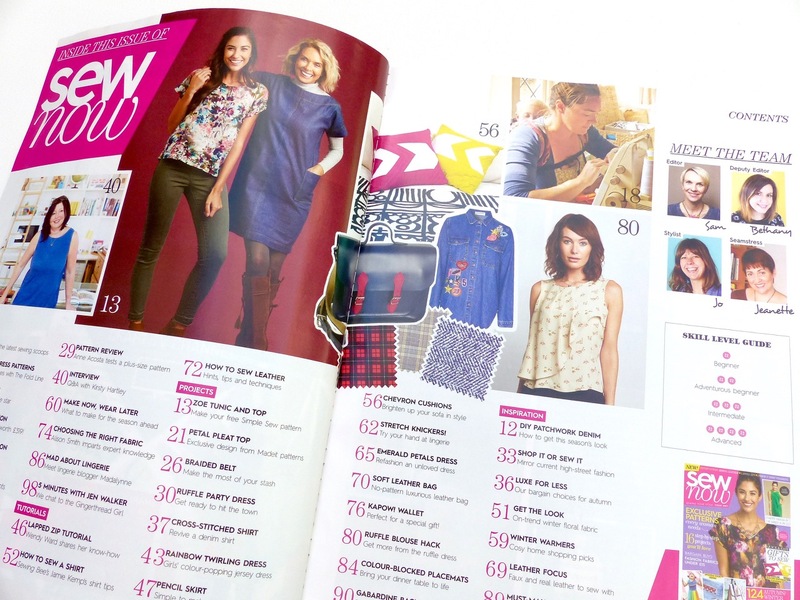 Sew Now magazine is available in the UK at WHSmith, newsagents and supermarkets. My daughter is a keen baker and linguist and what she loves reading about baking traditions in other countries. All those times making scones and cupcakes when she was little have paid off; she is now a much more proficient baker than me and we have a regular cake supply whenever we need it. 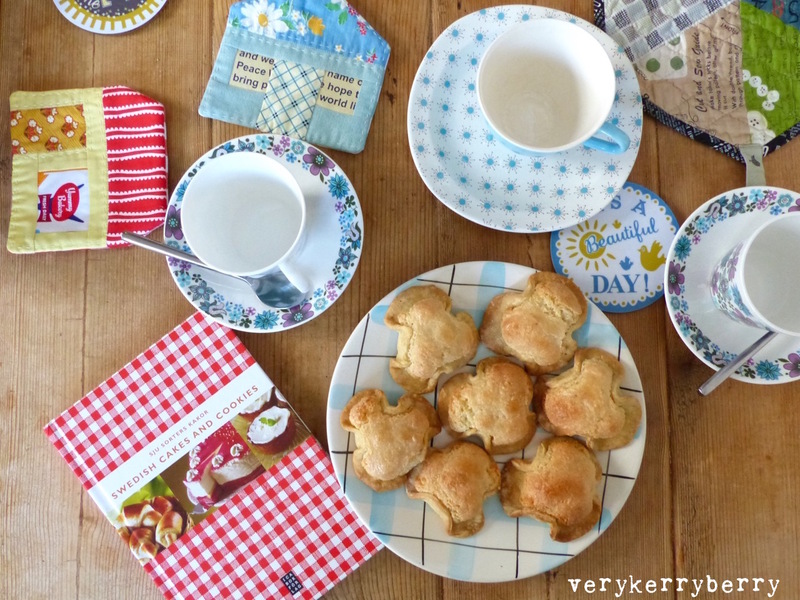 She recently bought Fika and Hygge baking book by Brontë Aurell of Scandikitchen. It's a mix of lifestyle and recipes, beautifully written with lots of text coming from Brontë's blog and the photography is gorgeous. The Danish art of 'Hygge' seems to have mainstream this autumn; bookshops have shelves groaning with little books of Hygge and crafty books making tealight holders, bunting and all sorts of things that seem to be a quick way of publishers making a money. What is it? I'm reluctant to define something that comes from a country that I haven't even visited so I'll link to Brontë's definition. Fika seems a little easier, it's the Swedish equivalent of elevenses, coffee break or afternoon tea. 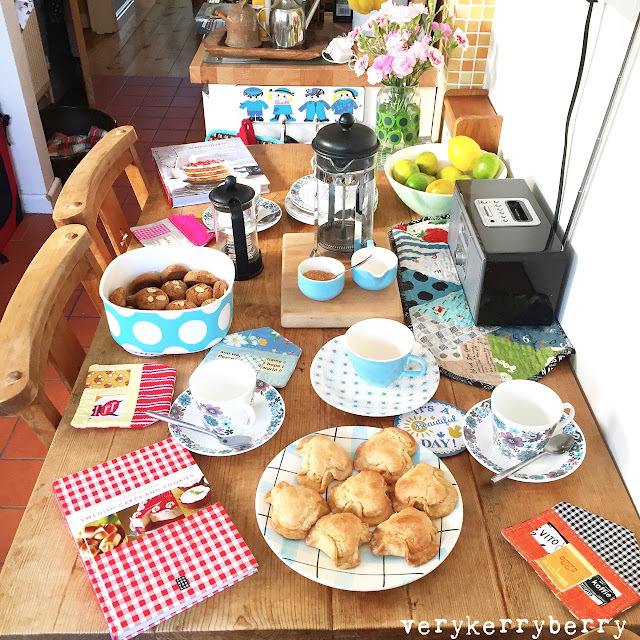 Coffee is at the centre of it and it also includes biscuits, cookies and little cakes. 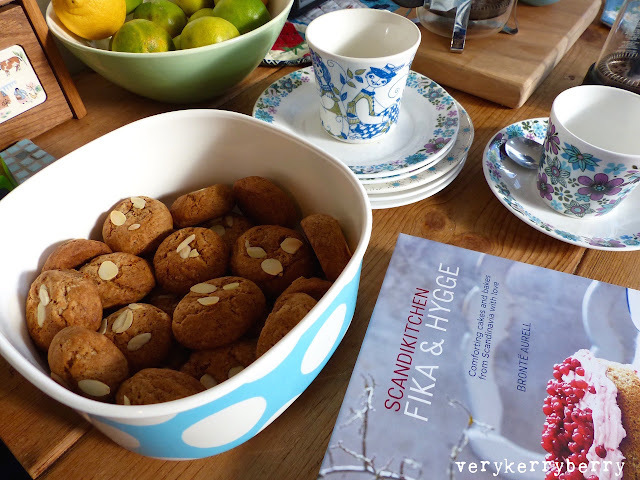 On reading Fika & Hygge, one of the key elements for the home baker is a book called Swedish Cakes and Cookies or Sju Sorters Kakor which seems like the Be-ro cookbook in British culture. These are traditional baking recipe books that started back in 1920s (Be-ro) and 1945 (Sju Sorters Kakor), every household has at least one copy and they have each been through many editions. I bought a bargain copy from eBay and it is a delight. Hundreds of recipes, several tips and skills pages and a photo for each bake. We decided to have an excuse to bake more than just for the three of us and have a couple of friends round on a Sunday morning a couple of weeks ago. The chief baker decided on Peppernuts which are a soft cakey spiced biscuits with a Christmas flavour (similar recipe here). These were an easy make and are lovely with coffee. She also chose something more complex, Napoleon Hats. These use a sweet pasty and a homemade marzipan which is then mixed with more egg and sugar so with all those processes, they took a while. We don't tend to cook with dairy very much so pastry always needs a lot of chilling as vegetable margarine replacing the butter is very soft. She made all the different mixtures over Saturday and Sunday and they came together on Sunday morning. I think they are intended to be quite tiny but for this first attempt they came out larger which turned out to be to all our benefit because they tasted amazing! They have a very short pastry and a squishy soft centre, with a strong sweet almond flavour, so good. I got out all my pretty vintage coffee cups and sauces which are a hotch-potch of different patterns but as they all include a light blue, they work together. The house coasters were a gift from Penny, from this pattern and you can just see a mini table runner made a quilty friend, Megan. 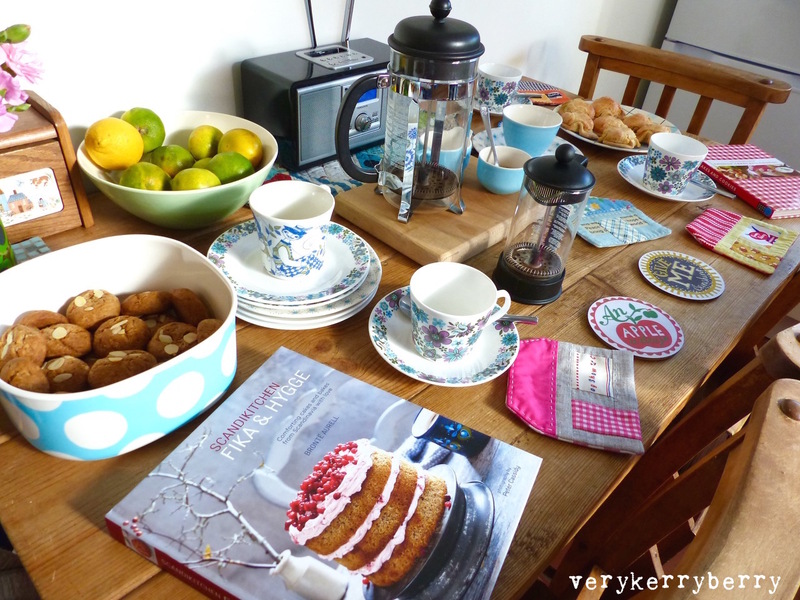 The sun shone, we all sat around eating and drinking, talked recipes, caught up on news and had a glorious time, the best sort of Sunday morning. Any cookbook recommendations out there which combine baking and tradition from different countries? Time to visit Plus Addict for my monthly sponsor post and I've seen lots of new bundles popping up where Kellie Rose mixes prints with some blenders from other ranges to great effect. My favourite is Vintage Daydream. I've also chosen some gift and costume ideas thinking ahead to the next few months! Moda, Wing and Leaf: this bundle includes some Moda Grunge and Makower linen texture. You can see all option for this range including precuts and individual yardage here. Baby Cord Cherries on Navy. I pounced on this and promptly ordered 3 metres when I saw Kellie preview this gorgeous cord on Instagram. Wide width, lovely soft quality. 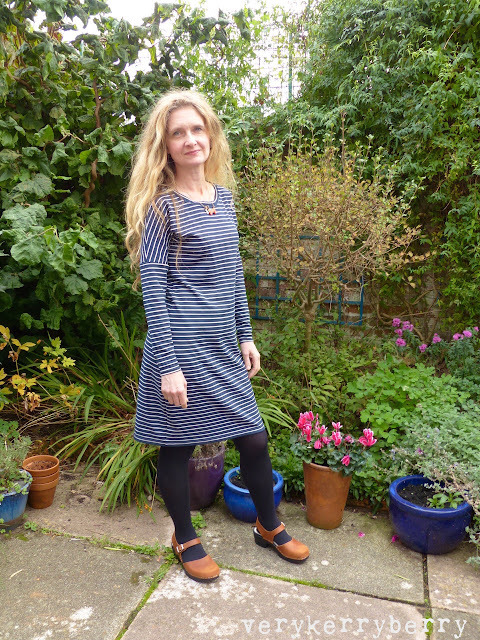 I think I am going to sew another long length Darling Ranges dress with mine. Riley Blake Princess Dreams. Kellie has mixed the Princess Dreams prints with Moda Grunge and Makower fabrics to create a fabulous little bundle for little girls with lots of pattern and colour. Individual yardage is here. Felt Craft Kit, Gingerbread Man: one of a selection of cute value kits that could make a good half term activity for older crafty children. Riley Blake Vintage Daydream. I seriously love this range and Kellie has combined the six individual prints that Plush Addict are stocking with the most perfect Moda grunge smudge gorgeous colours. Metallic Gold Effect Dancewear Stretch Fabric. We are coming into the time of year where costumes and fancy dress need to be made. This could even be used for some sparkly lingerie - gold bralette maybe?! Riley Blake, Mid Mod. 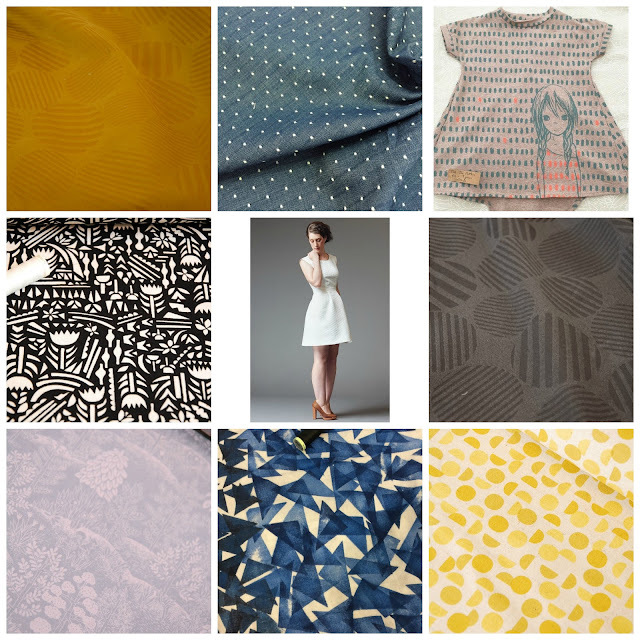 Retro colours and shapes from designer Emily Haye, mixed in with some great mixers chosen by Kellie. See individual yardage here. Spool shape Novely USB stick 2GB. Great gift idea, get organised early! Moda Shibori, Kelly has combined these indigo and tie dye inspired prints with some Grunge and linen texture to make a gorgeous blue bundle. Individual prints can be seen here. Following on from my review of the Sew Over It City Break Capsule Wardrobe, in particular the Molly Top, here's the sequel, the Molly dress. I don't usually wear this sort of dress- i.e. Knit and a shift sort of shape but I've recently discovered some tights that I can tolerate; they are not tights in the classic sense and let's not even talk about the name but they work for me, and this opens up wardrobe possibilities with some autumn and winter skirts at a length other than maxi. I used fabric from Sew Over It, a present from my husband was some fabric of my choice for my birthday last month. I knew this would work with this style as I think it is in the eBook. It's a soft stable jersey called City Stripe. A mix of fabric snob and sensitive skin has always put me off this fabric like this with a high manmade content but this is lovely quality, has a great feel and is a dream to work with. It's very stable and behaves itself beautifully at all times. I had quite a bit left over, maybe a skirt next? I have a couple of tips for handling the stripes. Firstly, for stripe matching when cutting out my top tip is to draw a vertical chalk line on the reverse of the opened out fabric, place the front or back main piece against the line. Pin in place and cut out the half up to the fold line, then flip it over the fold. 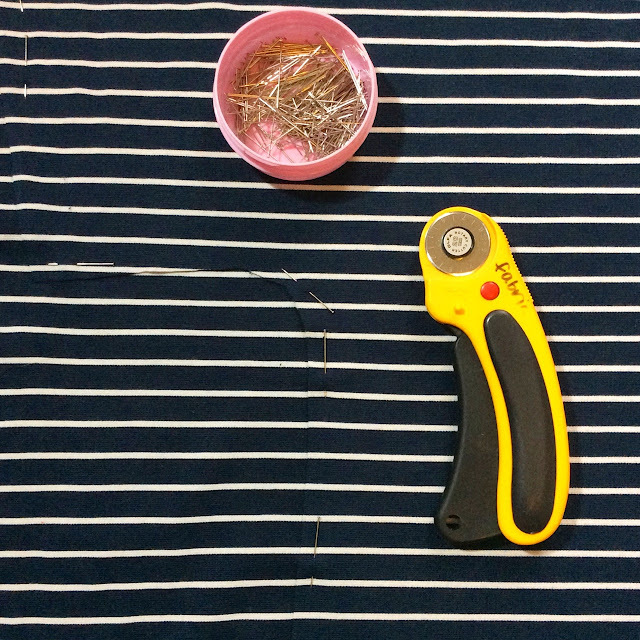 Match the stripes, pin again and cut. Follow the pins and you can just about see the underarm area in the camouflage picture below! My other tip is to hand baste the neck band firstly in half to keep it folded, then hand baste it to the dress neckline. 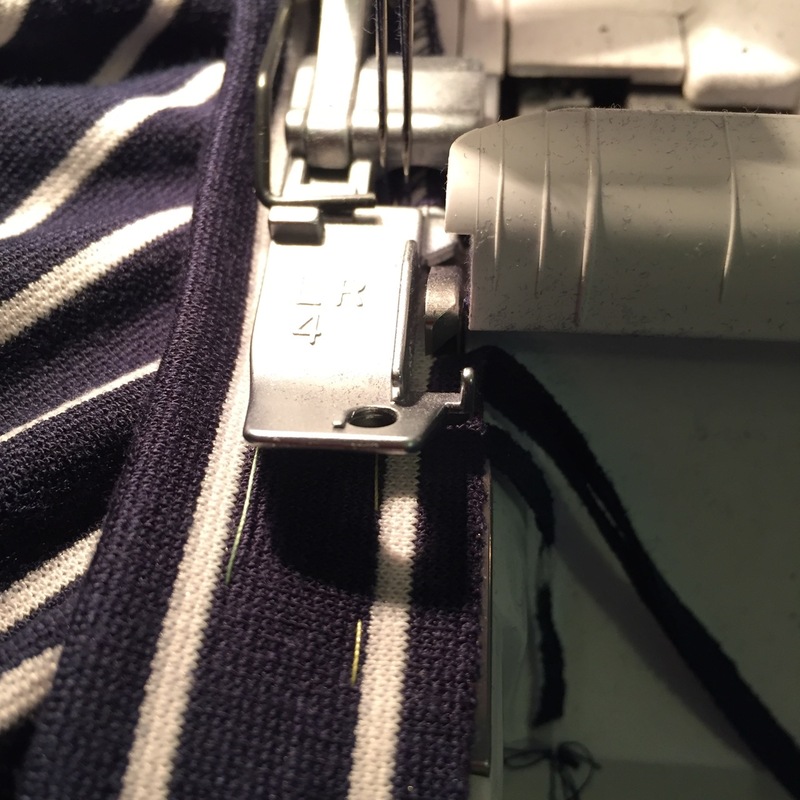 This then allows you to be very precise if sewing with an overlocker and to keep an equal distance from the seam and the parallel stripe the same all round without having to worry about anything slipping - with this level of contrast any deviation would be rather obvious. I cut a size 8 as with the Molly Top but I did make alterations. 1. Did a rounded high back adjustment of ¼" using the Fit for Real People book. 2. Added ½" to the hem so I could take up a slightly deeper hem than the stated ⅜"- final length only slightly added to. 3. Added ⅜" to arm length to make them slightly longer for colder weather. 4. Tapered side seam from just below underarm with a reduction of ½" at the waist front/back and on each side and tapered down to the hip The lower skirt width is unaltered. 5. As with the Molly top I used a longer length for the neckband as the fabric wasn't especially stretchy and used the Colette neckband tutorials My neckband was 90% of neck seam length, plus seam allowances. The neckband width was reduced by ⅜" on each long edge. My photos are a little lacking in smiles, I had a heavy cold at the time and I wasn't feeling my best (all recovered now) and that rather belies how happy I am with this dress! 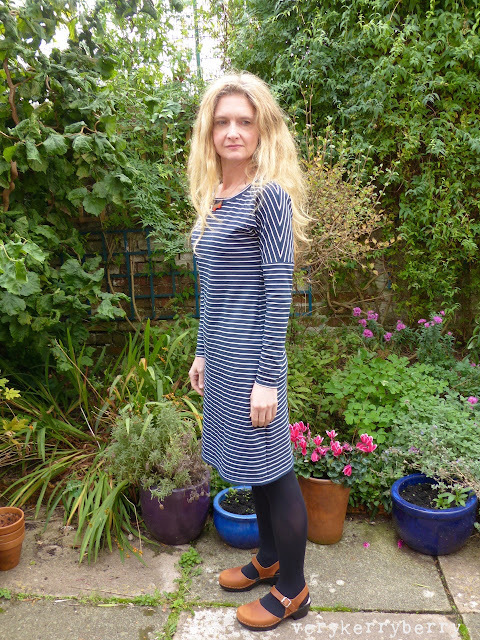 It's comfortable and easy to wear and has that chic style that a navy stripe so easily creates. Today it's my turn on to share the next block as part of the epic journey of 100 mystery Splendid Sampler block quilt. (If you are new to the #thesplendidsampler, the basics are here, there's still time to join in). My block is called First Stitch and recalls my first stitch stitches from when I began to sew. 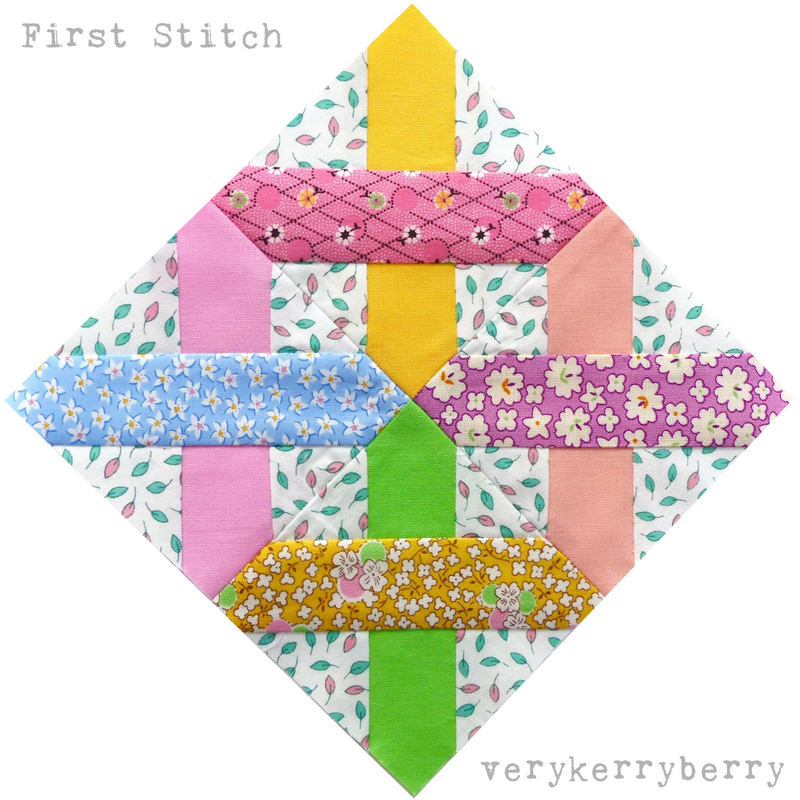 This cross-stitch style block was inspired by the beginning of my sewing journey. I've been sewing for forty years - I started young! My mum taught me the basics and I was lucky enough to spend my primary school years at an exceptionally creative school. 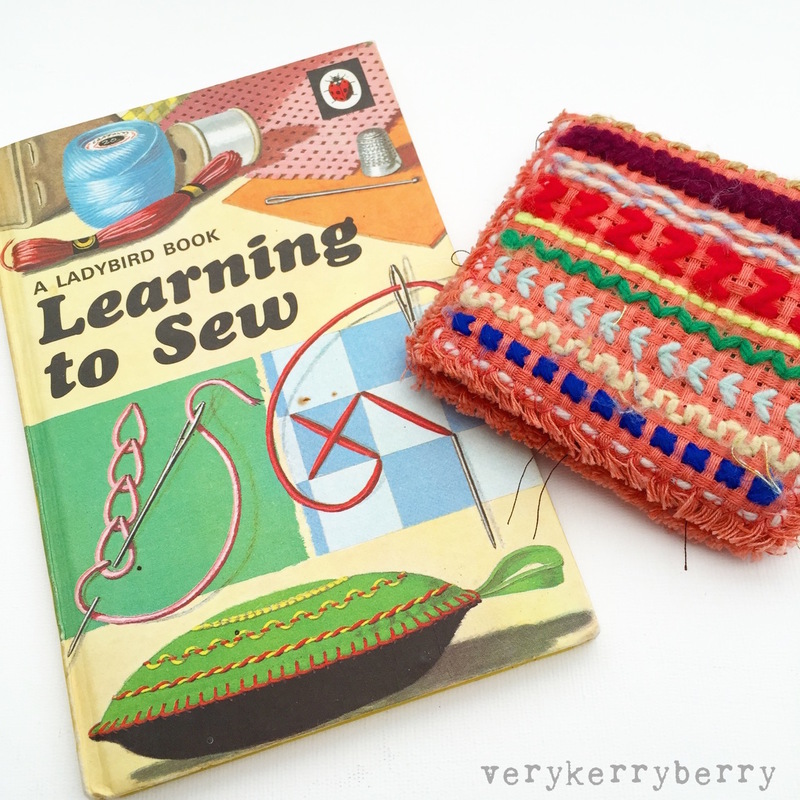 In my desk tray, along with my reading book, maths jotter and pencils, there was always some sewing and it wasn't just me, everyone in the class would have some sort of textile craft on the go. The needle book below was a school project from when I was seven or eight, We sewed samplers on Binca canvas with wool and a classroom assistant turned them into needle books. I'm very sentimentally attached to it and still use it today. I was obsessed by sewing then, and nothing has changed! First Stitch also echoes the traditional quilt block Kentucky Chain. 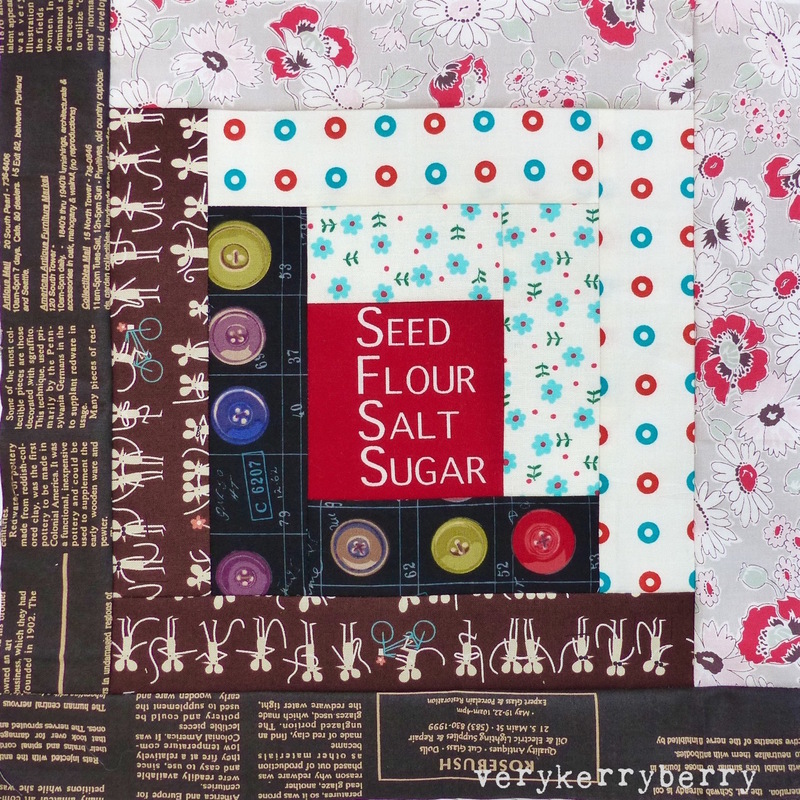 I didn't know that block when I was sketching out the block but all ideas come round and round in quilting as part of its history and continuation. 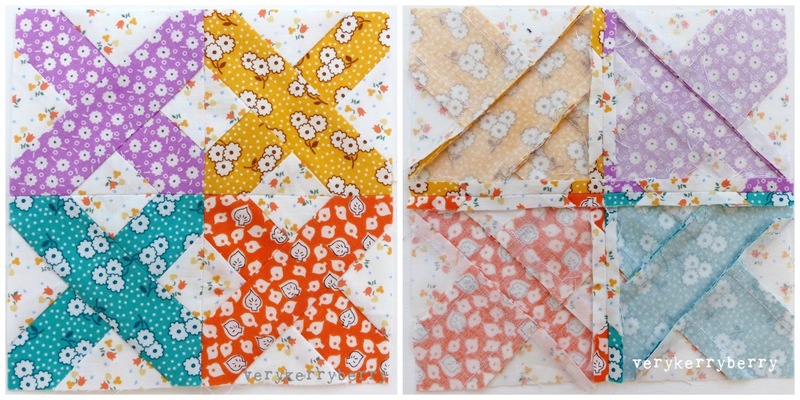 To share it, I thought I 'd sew up some variations to show different colour and fabric ideas. The reverse view below gives you a clear idea of how the block seams lie, the foundation pattern is designed to create nesting seams. 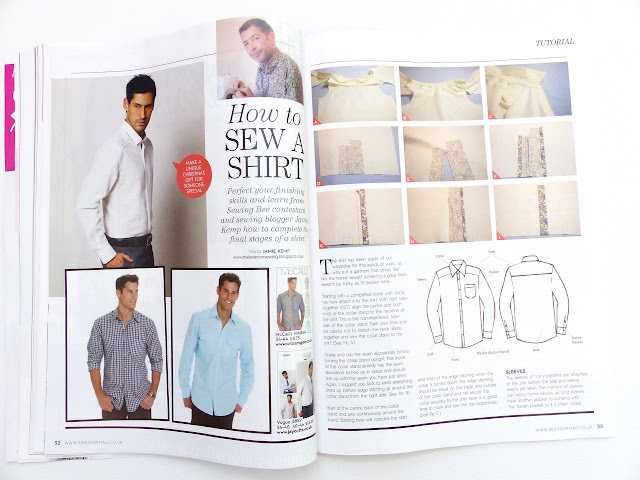 The instructions include dimensions to pre-cut your pieces so you can use your fabric more efficiently and not worry about your fabric being the 'right' size. 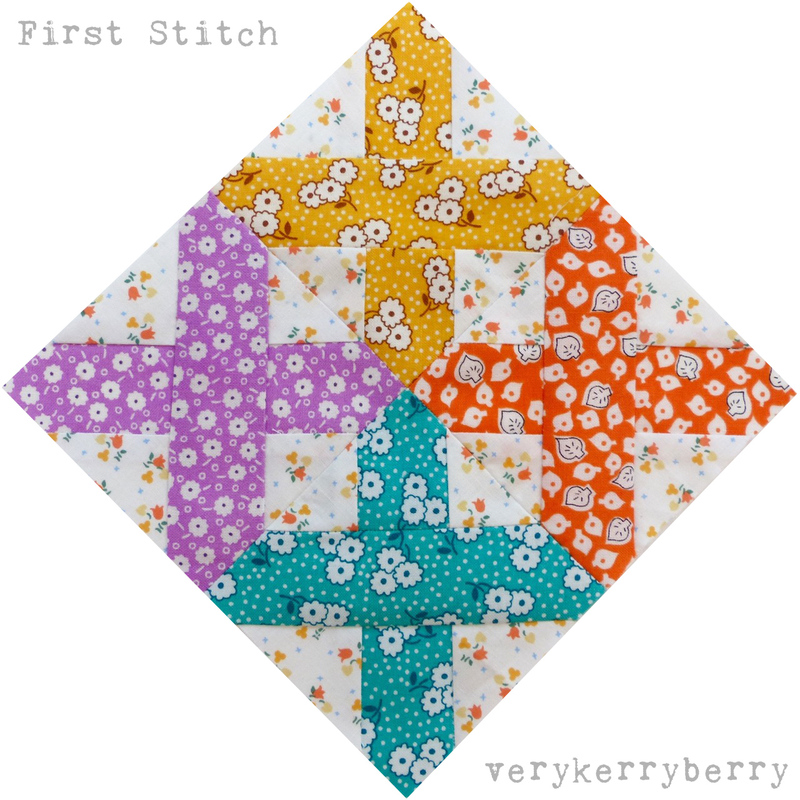 My original First Stitch blocks were sewn for this project last year and were made with some mystery fabrics. 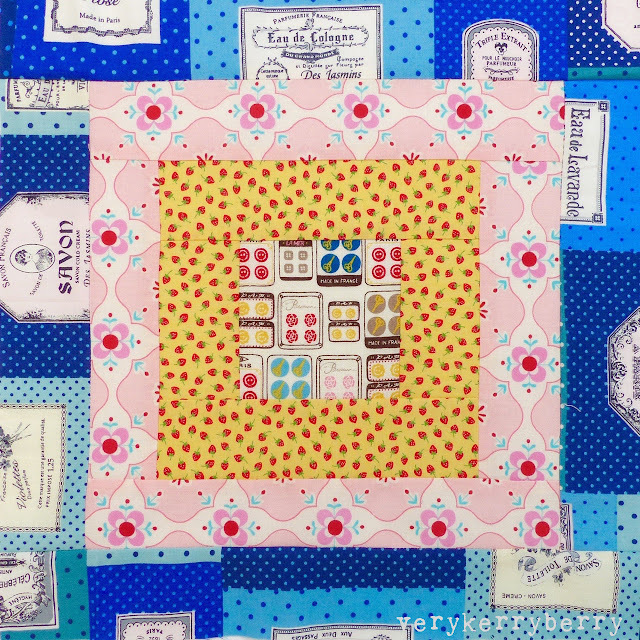 Each designer was sent a selection of Moda fabrics and mine was a 19th Century repro collection (I never found out the name) and you can see how those little prints and rich colours change the feel of the block. You can find the pattern link here and the foundation paper piecing tutorials here. 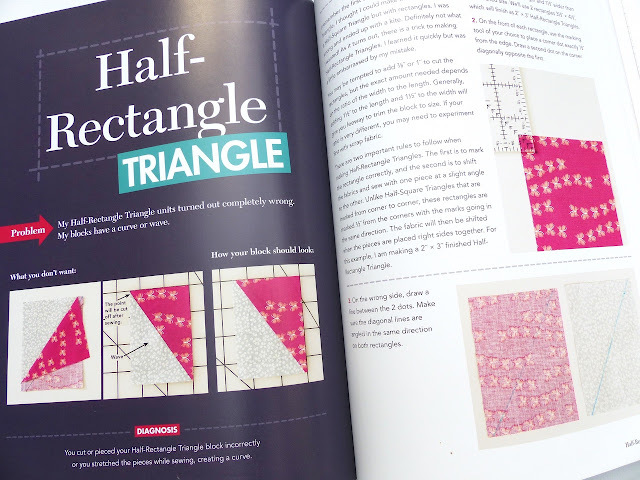 When you cut out your paper patterns (there are four to create the four cross stitches that make up the block), you need to cut along the dividing line between sections A and B. This leaves you with no seam allowance on these diagonal edges so make sure your fabrics extend by at least ¼". If you precut your fabrics following the instructions, this should be easy! 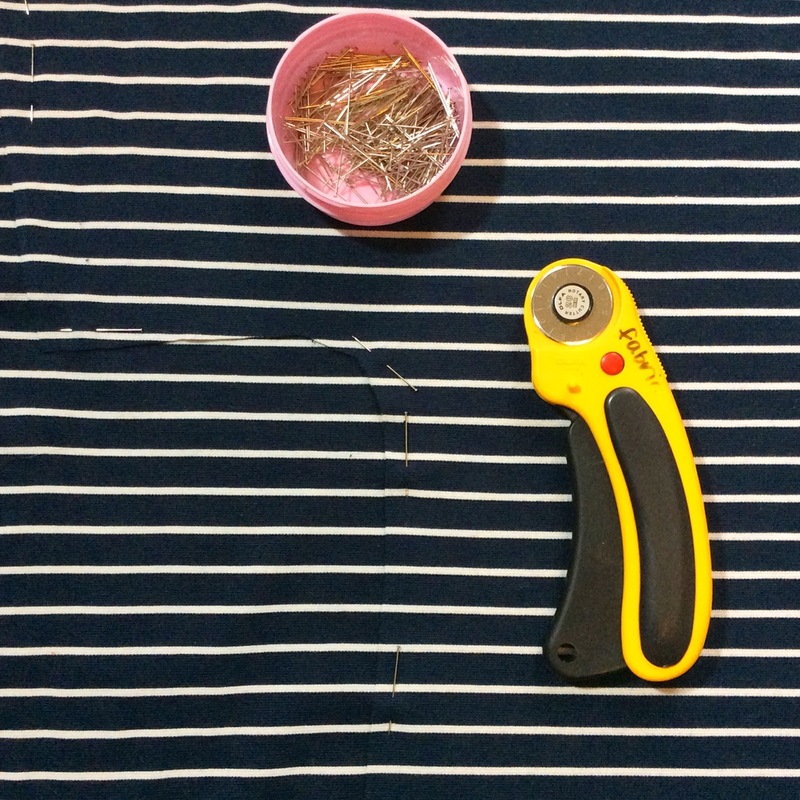 Once the section is pieced, you can allow ¼" seam allowance before cutting the diagonal fabric and trim the outer edge fabric in line with the dashed paper edges. 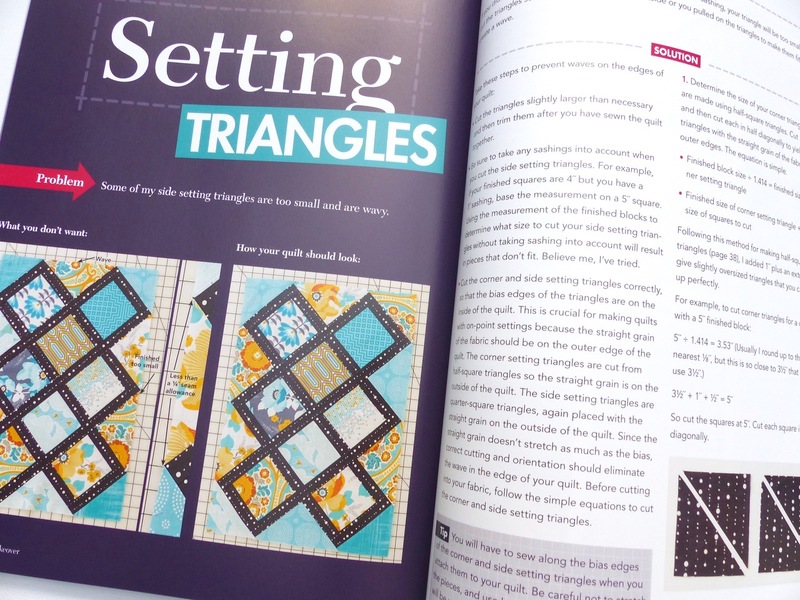 The process is the same for section B. I use an Add-A-Quarter ruler when paper piecing and it's very handy for adding ¼" seams like this but any quilt ruler will work fine. When you join sections A to B, leave the paper intact. 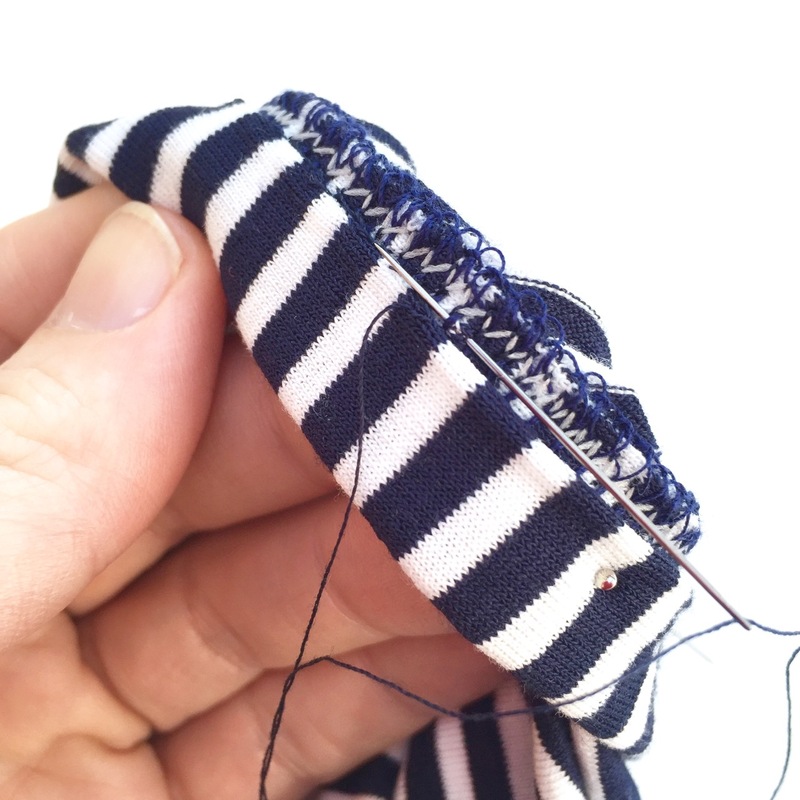 There's a tick mark - a little perpendicular line at the centre of the diagonal seams on sections A and - to help you pin and line up your seams perfectly, just match and pin the tick mark and the beginning and end of each seam before stitching the seam. Once the seam is sewn, the best way to remove the paper without ripping out your stitches is to tear into the paper a little at the centre of a seam and then tear outwards. This keeps the start and end stitches of your seam intact rather than straining them. Here's a few other versions I sewed up, this time as part of my Farmer's Wife 1930s sampler quilt. the quilt along is finished now and I'm about to embark on assembling the blocks. 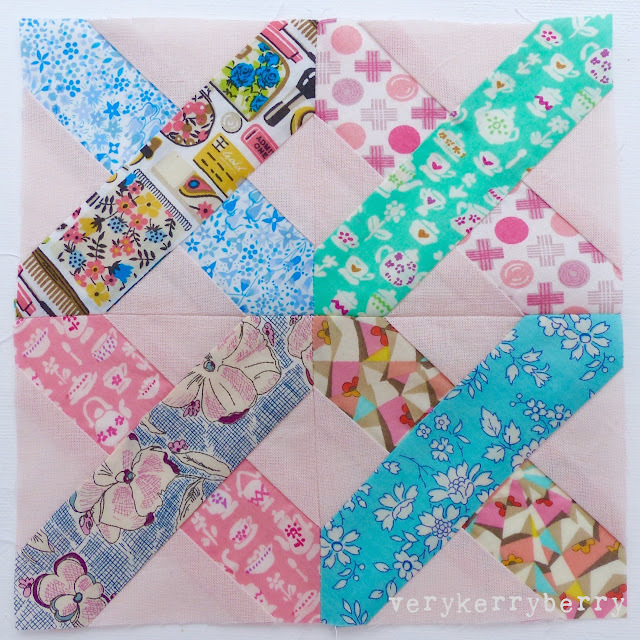 I've places this block on point to fit with the quilt layout. And here's the square-on view. I love the bright pastels mixed with the 1930s prints! For this variation, I kept it a little simpler with each cross completed in two fabrics instead of three. Here's my blocks so far. Seeing them all together wants me to sew some more. Part of the joy of Splendid Sampler is that its totally up to you. 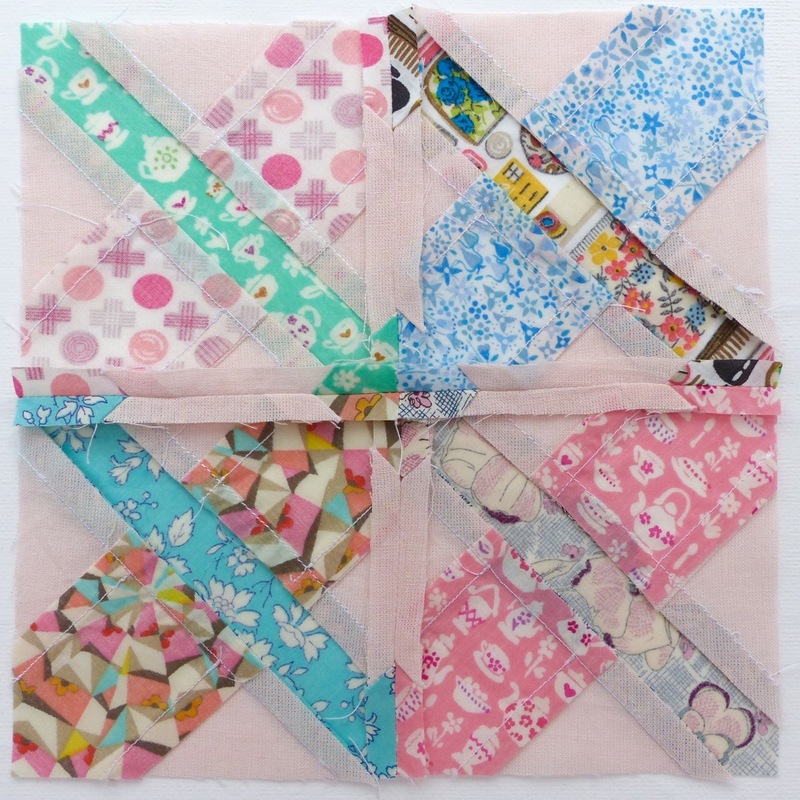 There's such a choice of blocks to sew, carrying constructions and methods and you can sew them all or dip in as the weeks' progress and just sew your favourites. The scale of this project is so vast with over 23 000 members in the Facebook group, but at an individual level, it's just down to you the piecer, and your blocks. Thank you to Pat and Jane for inviting me to be a part of this project. 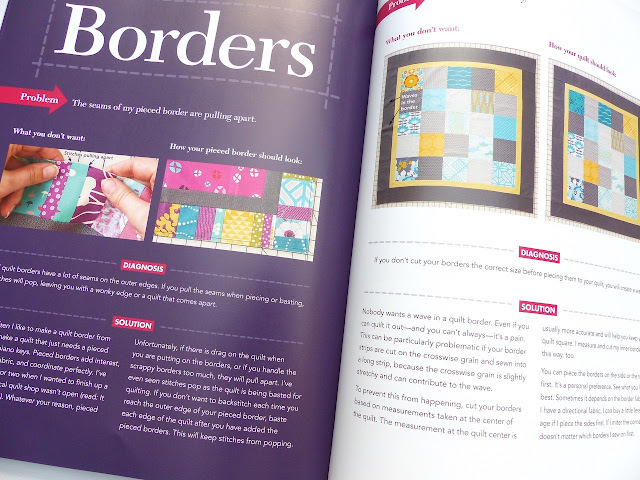 I've been more than a little blown away by how it all took off and the management and time commitment from this amazing quilty ladies as well as the other Splendid Sampler designers! Check out #simplesamplerQAL on social media and find out more here at Sewing Directory. Time for my monthly visit to Village Haberdashery and as always happens, as soon as I start to chose some fabrics from the newest arrival, a palette starts to form and a matching fabric selection appears. There's a mix of jersey, lawn, linen, chambray, yarn dyed broadcloth and quilting cottons, so something for everyone. Nightfall, Lunation in Dark. by Maureen Cracknell for Art Gallery Fabrics. Available as a super smooth quilting cotton and also in a wide width silky voile. Cloud9 Window Dressing and Checks Please. Checks and plaids have been such a hit this year and that's no surprise as these yarn dyed cottons are truly versatile for quilting, clothing , bags and more. The colours are bright and uplifting. Personally, I think any of these would make amazing pyjamas. Chambray Boulevard prints, Robert Kaufman. Southwest Stripe and pin dot, both printed on lightweight chambray, a good match for the Harrison Shirt pattern. The Harrison Shirt by Cashmerette. This classic shirt pattern was a year in the making and testing to get the fit just right. It has double princess seams and is designed for curves, size range 12-28 and cup sizes C/D, E/F and G/H. 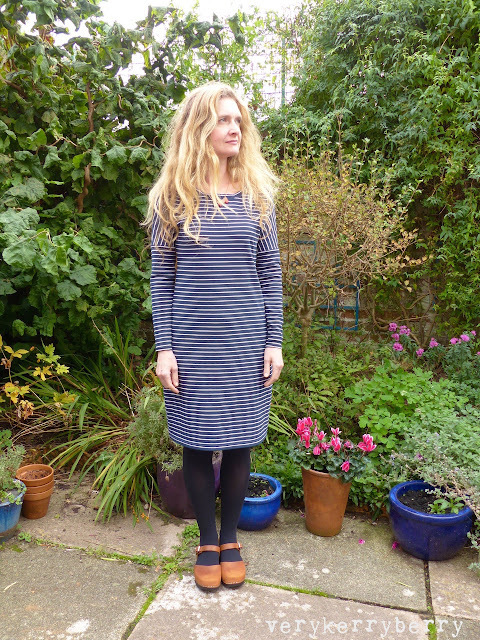 Jenny has released superb patterns since she launched her pattern brand a year ago. The tester photos in her birthday blog post show why her designs have been successful. Observer Knit, Mesh with Me, April Rhodes. Lovely inky irregular graphic print on cotton/lycra jersey. Euclid, reflect in Natural, printed Essex linen, Carolyn Friedlander for Robert Kaufman. Gorgeous designs for clothes, bags and cushions. Pixie Noel. 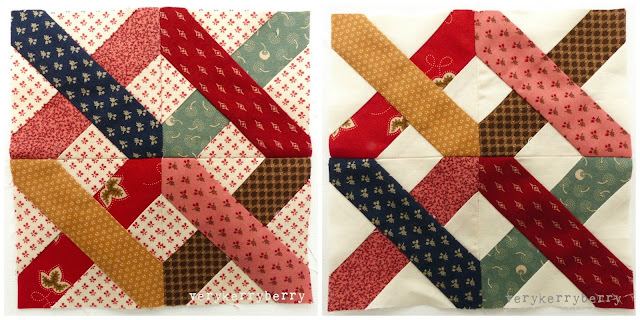 Tasha Noel's Chrismtas quilting cottons for Riley Blake. I find that most Christmas fabrics don't have the staying power for me, if they are going to appear each Christmas they need a timeless quality and these do. These designs are pleasingly nostalgic and the colours are crisp and bright. 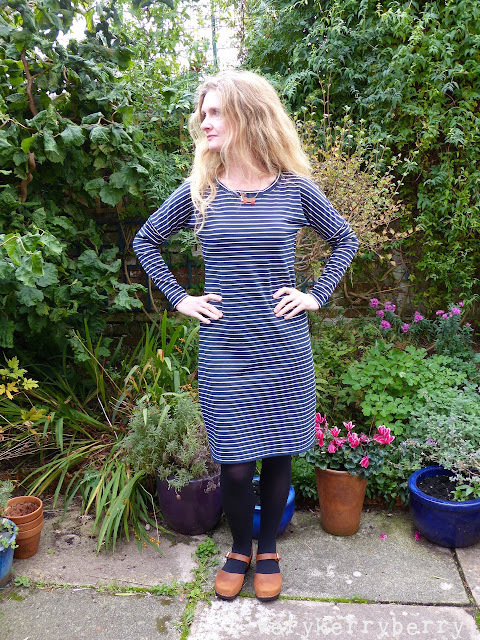 From Porto with Love lawn, Fishies in navy, Sarah Watts for Cotton +Steel. I just love it, the pink line against the navy- perfection. Another fabric suggestion for the Harrison shirt. 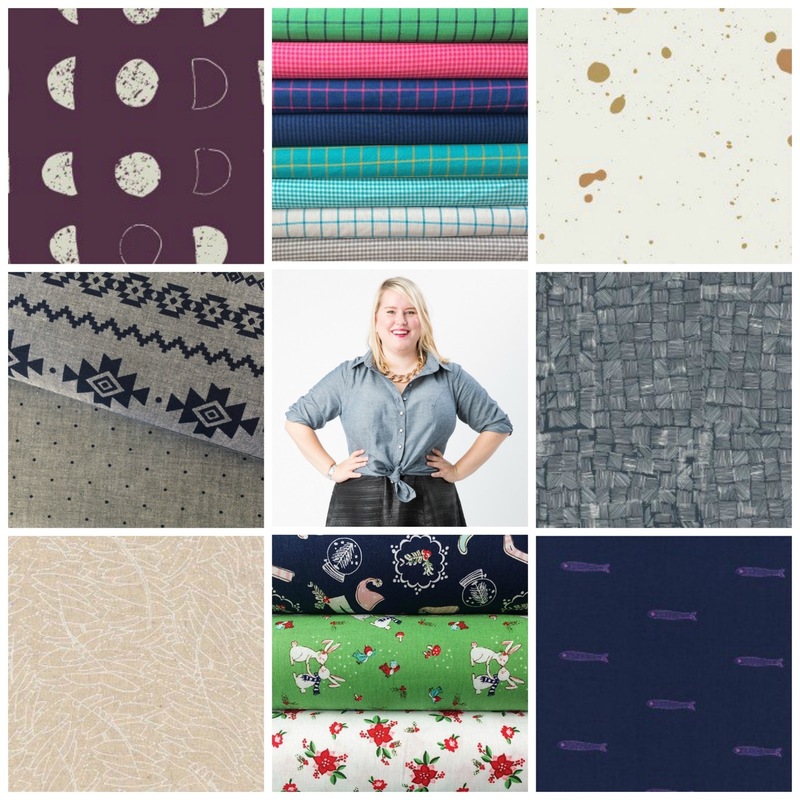 Of all the new Indie pattern releases for Autumn, and there's been a lot (check out Fold Line and Diary of a Chain Stitcher for detailed reports), the Sew Over It City Break Capsule Wardrobe really caught my eye. It's an eBook, comprises of five pattern, plus variations to take you from day to night in any city. It's good modern basics for everyday living. 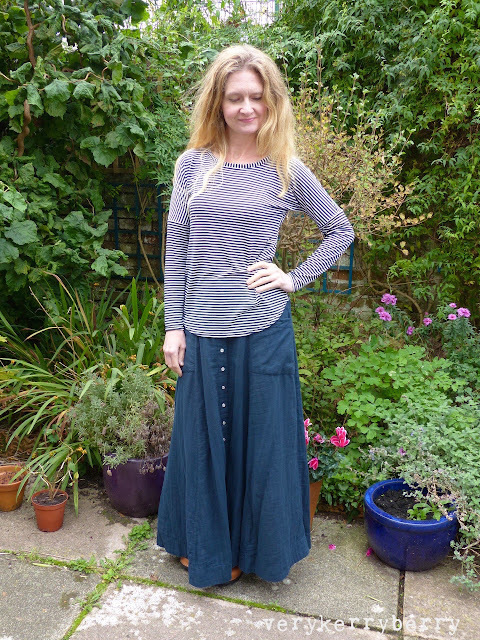 The Molly top is simple but different enough to make me want to buy the eBook (£20 for 5 PDF patterns including the variants). 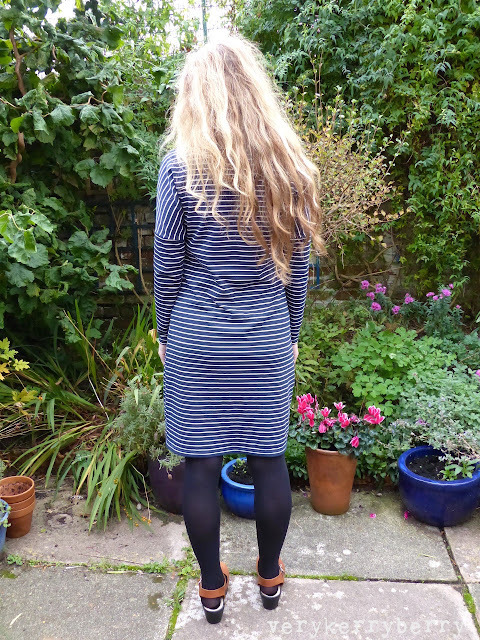 I found a drapey viscose stripe on eBay from this seller (she has some great stuff). It's a top which really benefits from drape and lightweight fabrics otherwise the drop sleeve/kimono element to the shoulder would be too bulky. This fabric was tricky to cut but sewed up fast enough. the instructions are entirely based on using a sewing machine and using beginner skills e.g. zigzag hem and topstitching rather than twin needle but I used an overlocker and double needle hemming, (see detailed thoughts on double needle hemming on drapey knit here). I cut a size 8 as my measurements match the Sew Over It sizing for that almost exactly. 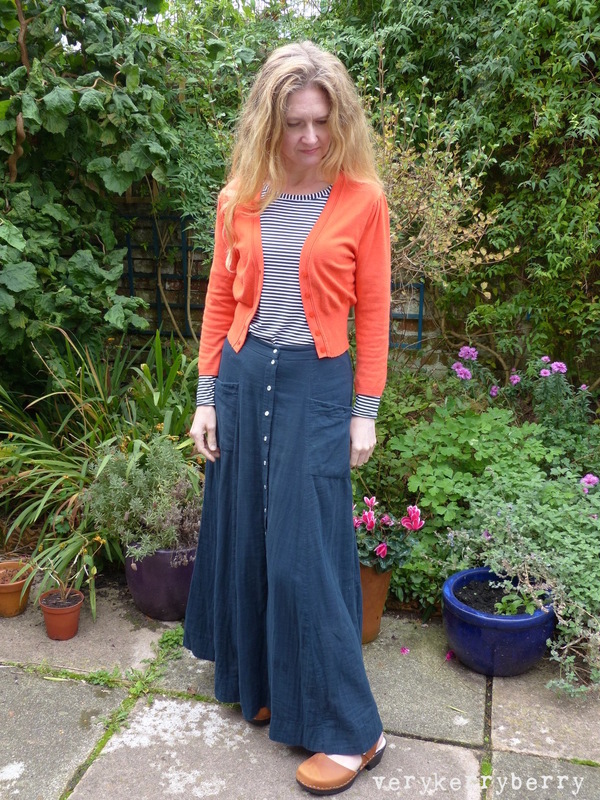 Alterations: I used a longer length for the neckband as my fabric wasn't especially stretchy. The Colette neckband tutorials are very helpful. My neckband was 90% of neck seam length, plus seam allowances. The neckband is quite wide- you can see this on some of the many beautiful photos in the eBook - the top edge of the band sometimes stands away from Lisa's collarbone. In the end, I folded my neckband over on the inside and stitched it down by hand using catch stitch. This criss-crossing hand stitch gives the inner neck edge enough elasticity and the neckband sat much flatter. I'll change the width when I make the next Molly. I shortened the hem by 1 ½" and the top is still relatively long for me (I'm 5'5"). It depends very much how you like to wear it. As the fabric is lightweight, it tucks into waistbands very easily. It wear well as a top or layered up. The sleeves were a very accurate length. I am very happy with the result, it's the sort of everyday basic that I can wear almost daily during cooler months. The top was a tester for me as I also bought Ponte Di Roma to make the dress and after completing the top I went straight on to the dress- blog post coming right up. 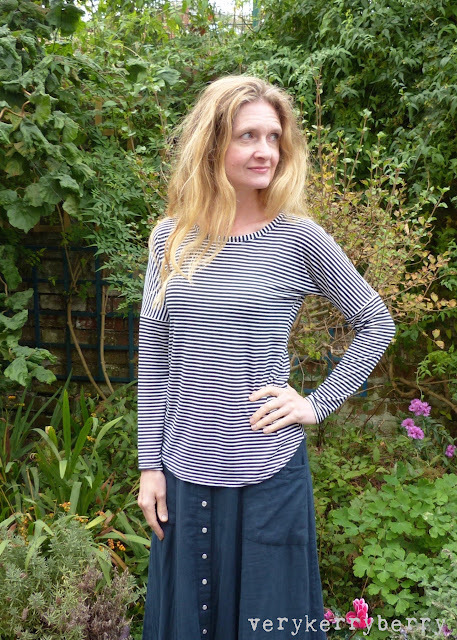 The Molly top is a quick make. I tend to take my time getting a good quality finish with a neat neck and hems but it's the cutting that takes the longest for me, especially with stripes. The eBook is packed full of pictures so you can see each item of clothing in a range of fabrics and situations and the investment that Lisa Comfort and the Sew Over It team have made in this eBook is clearly evident. I did wonder if I was buying this book because I was drawn into the Parisian setting, persuaded by the many blogger reviews and endorsements and was generally enchanted with Lisa in all her outfits, but actually it's a well thought through idea and Sew Over It have a handy feature in their online fabric shop where you can choose their garments and they suggest suitable fabrics, thus solving the hardest part of online fabric shopping - see the suggestions for the Molly top/dress here. Part of me wonders if the Capsule wardrobe concept is going to be continued with different eBook mini wardrobes for various occasions? That would be great! For these photos I've worn the top with a Deer and Doe Fumeterre skirt. Both these items will be heavily worn in the next few months, you can't ask for more than that. 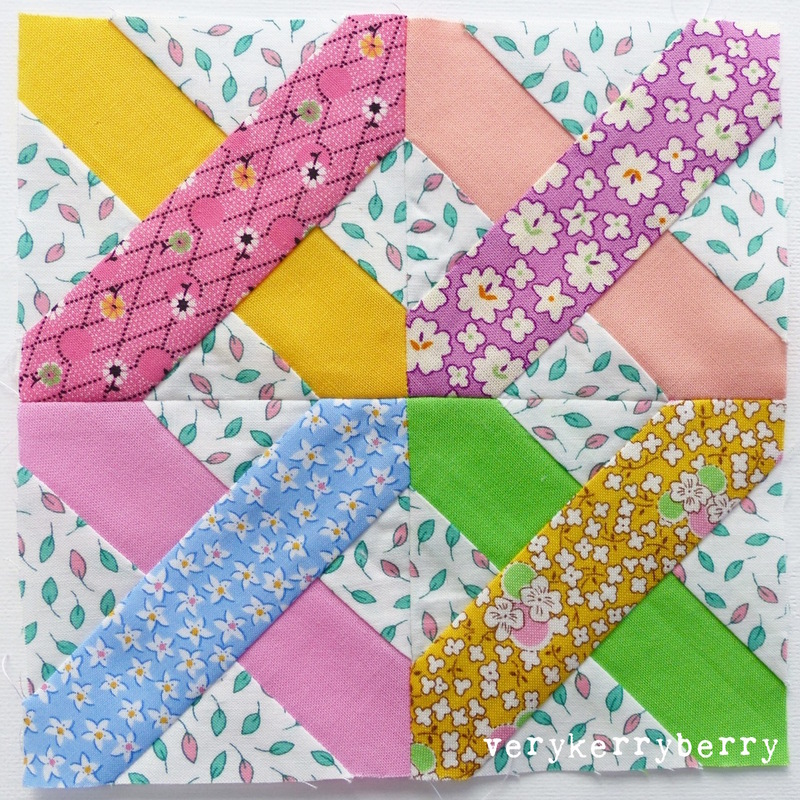 Simple Sampler Quilt Along Starts Today!